Few activities can match the thrills of whitewater rafting. While advanced rafters can attempt seriously dangerous water, beginners with virtually no experience whatsoever can also participate, with the help of a trained guide. Whitewater rafting is a great sport for children and adults alike, although often there is a minimum age of six. So why not treat your family to an experience they will never forget this summer, and once you can return to again and again? You won't regret it! Whitewater rafting is a sport for old and young alike. 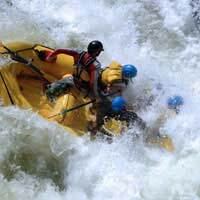 It involves taking a raft down a river and navigating the turbulent water, or rapids, for an incredible adrenaline rush. It also is a chance for the whole family to experience nature in an unparalleled setting. Whitewater rafts range in size, and can accommodate anywhere from six and 12 people. Participants are asked to sit evenly on both sides, and an experienced guide accompanies them and negotiates the river. Often, adults or older children are given paddles so they can participate in calmer spots. Companies that offer rafting trips insist that participants wear life jackets, and many also insist on safety helmets. Very advanced rafters in dangerous waters wear wetsuits as well, and a first aid kit is always onboard. Don't be put off by the fact that rapids can be dangerous. Rivers are graded according to their inherent difficulty, so choose one that is relatively easy. Class I. Very easy. Great for float trips and small kids. Class II. Easy but with waves. Good for kids. Class III. Has waves and backwaters that require rafters to have good experience in manoeuvring. Good for older kids with experience. Class IV. Very turbulent, requires advanced skill level. Class V. Extremely difficult, avoid with children. Class Vi. Permanently risky, avoid with children. Scenic float trips are an alternative to real whitewater rafting, and are often more suitable for very small children as well as disabled children. They provide entire families with the opportunity to see nature for themselves in a beautiful river environment, floating down slowly on a large raft. Some companies will accept children as young as four when accompanied by a parent or guardian. Often guides who take people on float trips are also trained to talk about nature, conservation and the animals you may encounter en route. Apart from being a sport, a float trip can also be educational – and fun! Remember, rafting trips with children should only be attempted on the advice of a professional, who is competent in taking the child's age, length of trip, skill level of trip, season and water level of the river into account to assess the situation. Don't try rafting on your own with your kids, or you may – literally – get in way over your head. Rafting can be a dangerous sport, although it may not look so at first glance, so play it safe by getting the advice you need. With younger children, it may be best to introduce them to the world of rafting by going on float trips first.